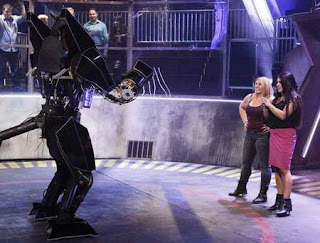 Syfy's Robot Combat League didn't really catch my attention as a must-see show when it premiered, but though I didn't add to my list of revisits, I do seem to find myself winding down on Monday nights watching the show. It's curiously interesting, at best. Robot Combat League has two pilots for each machine, one operating the movement of the unit, the other, the arm swinging powerhouse source, as they face off against a different 7 to 9 foot tall robot in an arena. Yes, it's much like the movie Real Steel, but not so fluid. Fluid motion that is, because plenty of fluid oozes out of our mechanical combatants in almost every round. The show itself, is filmed in such a way to keep you on your toes. It features quick shots, with no lingering. This way you might not be deterred by the details. It has a little bit of eye candy (compared to the group itself, not in general) here and there, and even a big Hollywood name gracing the stage. George Lucas visited his MMA-like fighting daughter while she helmed one of these things... and lost. The robots come out swinging... sparks fly with the hits, but I suspect they're planted pyrotechnics. I mean, seriously, if the bot gets hit in the head, sparks should not fly from the midsection. Right? Sometimes hydraulic lines ... wait, almost every time, a hydraulic line busts open and fluids ooze or spurt out of the metal beasts. Other times, arms and protective paneling go flying. And occasionally, an arm goes limp, a fist goes flying or a head gets knocked off. Heck, at one point, a robot just folded over in half because of some sort of mechanical failure. It's not over-the-top fun, but like I said, not a bad time filler. Though I must admit, those really quick snapshots of the spectator crowd going crazy, seems a bit too much. And it does not seem to matter what kind of experience the pilots have... the contenders who were real-life military, boxers or MMA fighters all seem to fold under the enthusiasm and luck of the nerdist jockeys. Does Syfy have a repeat contender on its hands for a second season? I'm not sure it does. The ratings vary from week to week. The February premiere episode netted 1.3 million total viewers and the show has been dipping in and out of the top-100 rated cable shows. And I'm not sure, but unlike the early rounds of fighting where it seemed like two cereal boxes were smacking each other, the latest episode had a pretty decent, back and forth fight/boxing session. And this time, when the hydraulic line busted open, one of the pilots got soaked by the spray that went flying up over 10 feet in the air. If anything, if this idea catches on and someone else grinds out some of the obvious flaws with the robots, Syfy can say they heralded the stand up, fighting robot reality TV era. Personally, I'd love to see this refined into something funner. Like NASCAR, it's not all about skill as some mechanical luck definitely steps in and says HELLO and GOODBYE! But I'm not going to hold my breath for a show renewal. But hey, I could be wrong.